John Berggruen Gallery is pleased to present an exhibition of new paintings by California-based artist Michael Gregory. Long Way Home marks Gregory’s eleventh solo exhibition at the gallery and will be on view July 10 – August 16, 2014. John Berggruen Gallery will host a reception for the artist on Thursday, July 10th between 5:30 and 7:30 p.m. to coincide with the San Francisco Art Dealers Association’s First Thursdays. 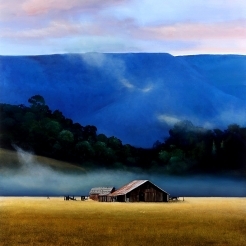 Michael Gregory is best known for his signature subject matter, that of barns, silos, and rural fields typically dwarfed against a backdrop of mountains or trees. Exhibiting a remarkable degree of photographic realism and richness in detail, Gregory’s paintings are entirely the product of the artist’s imagination. His landscapes are “constructs” of different buildings and places assembled and recreated by Gregory in his studio. In contrast to the tradition of “plein air” painters, Gregory does not aim to paint was he sees. Symbolic of a psychological state––an “inscape”––rather than a direct representation of the external world, Gregory’s landscapes become the stage sets where human drama plays out. Examining the seamless interaction between the geometry of the buildings and that of the landscape, Gregory calls attention to the barns and structures he paints as archaeological sites and remnants of lives once lived now eternally frozen in time. As such, the paintings in a Long Way Home are best classified as landscape portraiture, deviating from the conventions of traditional landscape painting in that they occasionally utilize a vertical canvas rather than a horizontal one. 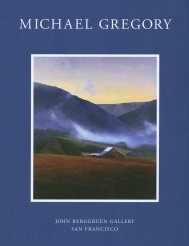 Gregory’s paintings, while set in a landscape, are not really landscape paintings. Rather, the landscape becomes the supporting character for people and their stories, told through what is left behind. The paintings in a Long Way Home, as the title suggests, celebrate the road trip. Unlike in previous exhibitions, the inspiration for a Long Way Home derives from Gregory’s travels in his own backyard––the scenic landscape of Northern and Central California. For Gregory, exploring and experiencing the unknown or the unusual is a fundamental quality of humanity, something he calls a “genetic necessity.” Gregory captures in his landscapes, which simultaneously oscillate between the bucolic and the eerie, an unparalleled sense of quiet stillness paired with an overwhelming appreciation for the vastness of this continent. Gregory’s paintings evoke a fundamental sense of loneliness, isolation, and dislocation that aligns with the character of the American West. The artist intends for the theme of the road trip to serve as a metaphor for internal exploration. The journey towards personal knowledge and understanding takes an indirect route, one abound in obstacles and diversions. The road trip is akin to such a journey because there are no rules and no map, just the admonition to take your time and enjoy the Long Way Home. Michael Gregory was born in Los Angeles in 1955. He received his BFA from the San Francisco Art Institute in 1980, and currently lives and works in the Bay Area. Aside from exhibiting on a regular basis at John Berggruen Gallery, Nancy Hoffman Gallery in New York, and Gail Severn in Idaho, Gregory’s work is included in many private and public collections including the Delaware Art Museum, the Denver Art Museum, The U.S. Trust Company in New York, Microsoft Corporation, General Mills Corporation, Bank of America, and the San Jose Museum of Art. The artist’s work has been shown at museums across the country including: The Arkansas Art Center, Little Rock; The Boulder Center for the Visual Arts, Colorado; The Fine Arts Museums of San Francisco, California; The Hunter Museum of Art, Chattanooga, Tennessee; and The Butler Institute of American Art, Youngstown, Ohio.